A 3v CR2032 Button Cell is used to power the icicle decoration. 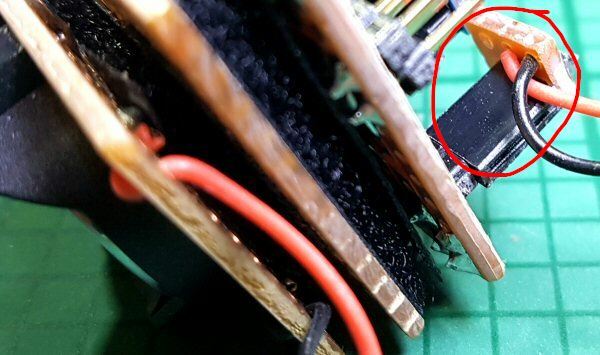 It is shown mounted in a battery case which is soldered to a piece of stripboard which is Velcro'd to the bottom of the LED strip. Please remember that this is my first prototype of this project so I might have ended up with more boards than I needed. If I ever build another I will probably put everything on the same board. But this one works for now. 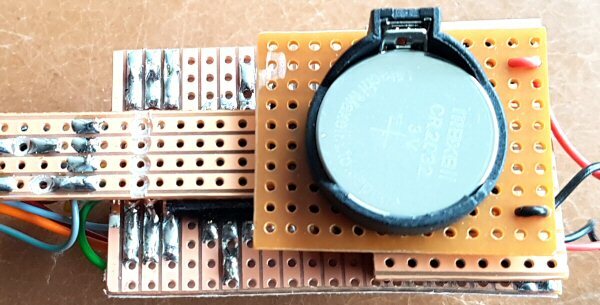 I did'nt make a layout for the battery board because it is so simple. Solder the 3v CR2032 battery holder to the stripboard making sure that the tracks are seperated then solder red and black wires to positive and negative respectively. Mount a two-pin header on a small piece of stripboard and solder the wires to it as shown to the right. The header can then be plugged into the pins marked 'Vcc' and 'Gnd' on the Pro-Mini carrier board. Pop in a CR2032 button cell and the icicle is ready to go. Well it will be when you have programmed a suitable sketch into it.